Ivy Scraps has a new boutique in their store called MiniPixels where every product is priced at $1. J New products will be available in this boutique on the first of every month using a common colour palette with the theme being the product designer’s choice. The first products were available on July 1. I have created a minikit called Waters Edge as my first MiniPixel product – available on August 1st. 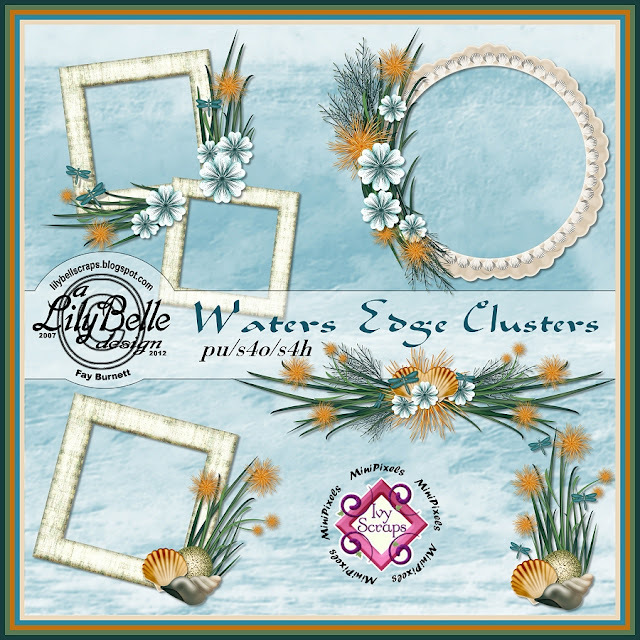 In the boutique there will be 4 downloads – elements, papers, clusters, and a free quickpage. The cluster preview shown below will give you an idea of what to expect from me but there are lots of other great minikits, alphas, paper packs, etc. available. I will also have a freebie for my faithful blog followers. (You must all be faithful because I certainly don’t post as often as I did in the past – old age is really slowing me down. J) I made something that I’m calling photo edgers. I thought that if you have a long story to tell and just a few pictures, placing the photos along the edge of the layout would allow lots of room for journaling. Placing photos along the edge of a page is also a great way to create a “white space” layout so photo-edgers should work for that as well. If you are interested, I just thought I’d give you a “heads up” so you can boogie on back here on August 1 to have a peek. These clusters are wonderful. Looking forward to seeing the rest of the kit. Love it, and waiting for the edges. I'm not writing a long thank you but I am certainly thanking you for the preview of what there is to look forward to. And as always, it's another winnter. Hugs.